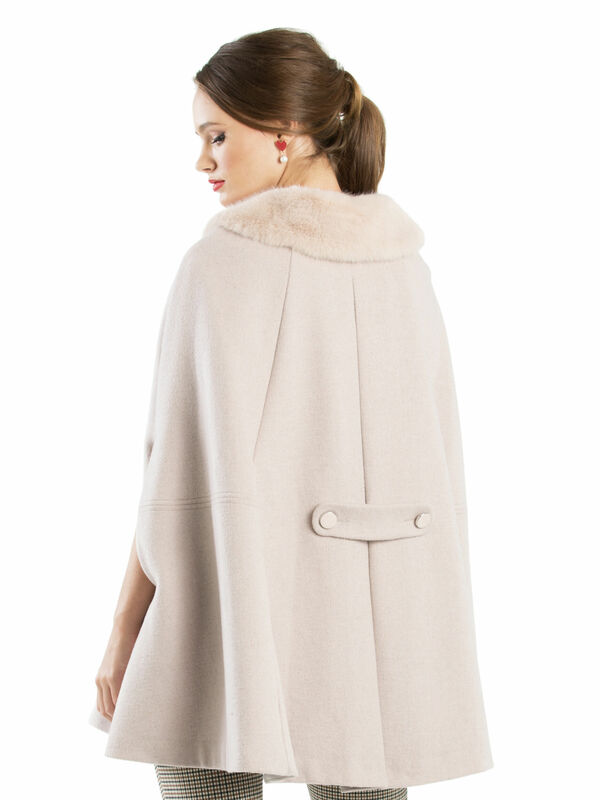 Majestic Cape https://www.review-australia.com/au/majestic-cape-coat-powder/RE19JK063.REWHT017.html Drape this Majestic Cape over any outfit for a magical autumn wonderland look. The powder pink wool blend cape is adorned with a super soft faux-fur collar, from which hang two adorable pom-poms, and lined with silky material for a luxurious finish. It fastens at the front with large glassy buttons, while subtle slits in each side allow arms to poke through arms, turning this cape into a jacket, if your heart desires. Worn with Chelsea Check Capri Pants and Beverley Heels. Drape this Majestic Cape over any outfit for a magical autumn wonderland look. The powder pink wool blend cape is adorned with a super soft faux-fur collar, from which hang two adorable pom-poms, and lined with silky material for a luxurious finish. It fastens at the front with large glassy buttons, while subtle slits in each side allow arms to poke through arms, turning this cape into a jacket, if your heart desires. Majestic Cape is rated 4.5 out of 5 by 2. Rated 5 out of 5 by ChristinaM from Great cape I love this cape, it’s lightweight but I’m sure it’ll be warm enough for winter. Lovely colour and I love the faux fur collar which is detachable. I wear size 16 and 160cm tall, and I purchased size Medium and it’s a perfect fit. The only thing I would change with the cape is the armholes I wish it was a bit larger. Otherwise it’s another fabulous Review item and I can’t wait to wear it. Rated 4 out of 5 by Lisa19 from Love the fur collar This cape is a large fit, I bought the size small and normally a size 12, it fits me easily. Looks great with legging style pants, but makes you look big if you are wearing wide leg pants.